These days I’m a woman on a mission, determined to cut back on the amount of salt in our diet. Paying attention to sodium is just about as important as maintaining a low-fat diet. Since my husband’s heart attack six weeks ago, I have been revamping old recipes, cleaning out my pantry and planning a healthier cooking lifestyle to benefit both of us. This is a lighter, fresher version of a recipe I’ve had for years. 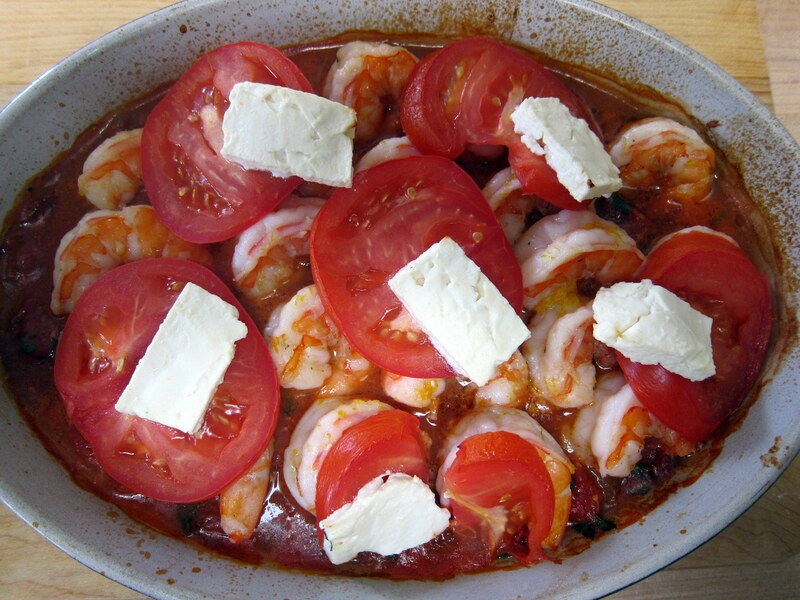 Although shrimp are relatively high in sodium, the remaining ingredients are not. I substituted lemon zest and juice for salt, and brightened up the flavor with fresh herbs from my garden. A splash of white wine perks up many shrimp dishes. Pernod would work as well. Although I used low-fat feta and reduced the amount of cheese by half, it is a salty cheese. I think I will merely crumble some on top of the casserole next time. I prefer to use fresh tomatoes when they are in season, but canned, no-salt tomatoes work just fine in the sauce. This is an easy recipe to double or triple for a dinner party. You can prepare everything ahead of time and simply pop the dish in the oven once your guests have arrived. I like to serve it with thin pasta or Israeli couscous. 1. Using a medium-sized skillet, heat 1 tablespoon of oil. Add the onion and cook until wilted, about 5 minutes. Add the garlic and cook for 1 minute. 2. Add the chopped tomatoes and wine. Stir and season with pepper and/or red pepper flakes. 3. Add the parsley. Using your fingers, strip the thyme leaves from their stems. Add to sauce. 5. Cook the sauce over medium heat until it reduces, or thickens, about 15 minutes. 6. Using a large skillet, heat the remaining tablespoon of oil. Add the shrimp and cook over medium-high heat for 1 minute per side. 7. Immediately transfer to a bowl. The shrimp will be pink but not fully cooked. Add the lemon zest and juice and stir to mix. 8. Spread the tomato sauce in the bottom of a shallow baking dish. 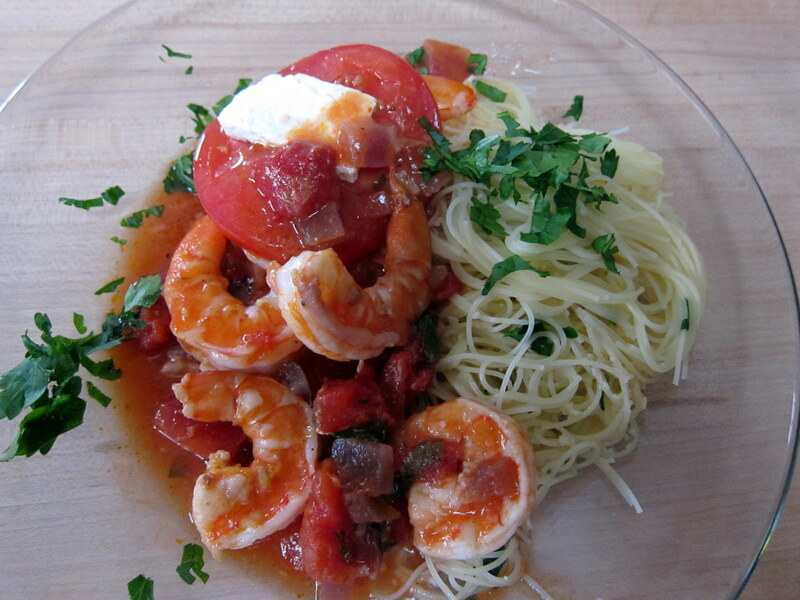 Next, layer the shrimp, then the sliced tomato. Top with feta. 9. Bake 15 minutes or until cheese begins to melt. Serve immediately. Mmmmm this looks great! I used to make a version of this and will now try this less salty version. It’s a challenge but I’m into it! Wow! Larry sure is lucky to have such a fabulous thoughtful wife. I have heard that sea salt has 1/3 less sodium then kosher or standard salt. I am not sure if it is true. Has ayone else heard that? I think Emeril told me. Good, because that is what I’m using these days. I also have a small jar of porcini salt to finish some dishes. Sounds delicious, Liz, and so healthy! Thanks, it was a new recipe when I cut back on the cheese and salt. This sounds like my flavor profile here! I love the addition of the feta…it really makes you forget about salt. I try to limit sodium also, and by and large found that it is not too hard if one avoids processed foods altogether (I even found a wau to make my own cold cuts! ); great recipe, that keeps a flavor punch preserved.